Handspun socks are a wondrous thing, but I work from home and run around in my socks all day on wooden floors, so they’re not the best for me. 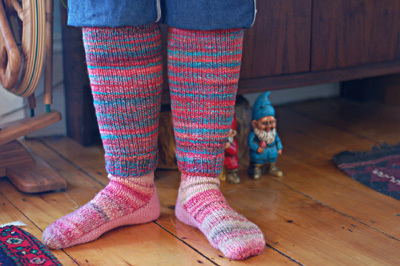 My heart seizes up a little at the thought of blown out heels on handspun and handknit knee socks, in particular, but a fan of knee socks I am. It’s COLD here in Boston in my little old house and I have enough chubby wool socks, so what I needed was to extend the length of these socks. Hooray for leg warmers! These are fitted, not the sloppy kind of my junior high years. They’re pure function, if you don’t count the high voltage color. They don’t take much yarn, either! This is undoubtedly the first pair of many, because – WOW- they are cozy. Size: 13″ long and 11″ around at the top, 9″ at the bottom (measured in stockinette section, not ribbing). Fit: My legs are 15″ around at the largest calf point and 8″ at the ankle, meaning I’ve got some negative ease going on here. I didn’t make them as tight at the bottom as the top because they need to go over chunky woolen socks. They’re soft and stretchy, so they are not binding in the least. PPS: Cobblestone’s coming. I haven’t had time to do her justice in both photography and a blog post. Soon! Oh, I love them! They are perfect to keep your legs warm in this weather. It is so cold in our old house today and those look so squishy and warm. so perfect! With you on wanting to wear knee socks but not wanting to darn heels. Those look wonderful and cozy, love ’em! What a perfect, practical idea. Love them, will certainly make a pair! Thanks for sharing. I’ve been thinking about legwarmers, too. And fingerless mitts. It’s starting to get chilly in our house, too. Great idea! But you have no shortage of those, do you! They’re wonderful. Do the gnomes follow you around when you wear them? Wow, those are awesome! I should make myself some legwarmers…I’m always freezing in my office. Oh yeah, you totally need to show off those leg warmers! They’re awesome! 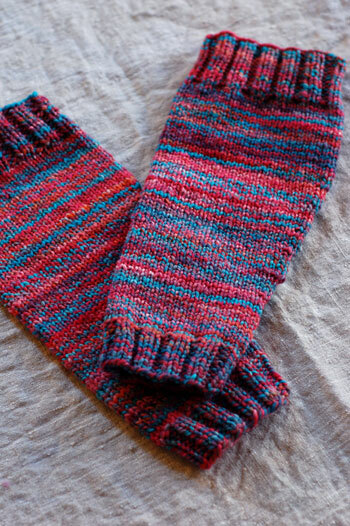 Hey – are you using commercial yarn on the soles of the handspun socks you’re wearing? They look very interesting; I’ve never seen a pattern like that before.